Step 1 To prepare the onions, place a small saute pan over medium-high heat and add a splash of olive oil. Saute the sliced garlic for 30 seconds, until lightly perfumed and translucent. Transfer to a small bowl and add one-quarter cup vinegar, one-half teaspoon salt, oregano, cumin and allspice. Mix well. Gently squeeze the water from the onion slices and add them to the bowl. Toss well to coat. Marinate at room temperature for at least 1 hour and no more than 2 hours before serving. Step 2 To prepare the sauce, place a dry skillet over medium heat. Add the chiles and toast for about 2 minutes, pressing them into the pan and turning occasionally with tongs to prevent burning, until they turn light brown and give off a sharp aroma. While the chiles are still hot, remove the stems and submerge the chiles in a bowl of hot water for about 10 minutes to rehydrate. Drain and transfer to a blender. Step 3Return the skillet to a burner over high heat and add the canola oil. When the oil is hot, add the pumpkin seeds, decrease the heat to medium-high and toss the seeds for 1 to 2 minutes, or until they begin to brown and become evenly crisp. Transfer to the blender. Place the sesame seeds in the pan over medium heat. Toast for 1 minute, until browned. Transfer to the blender. Step 4Add 1 tablespoon vinegar and one-half cup warm water to the blender and process on high speed for about 1 minute, until pureed, scraping the sides occasionally. Add the garlic and salt to taste and continue to blend for 30 seconds, until the sauce is the consistency of a wet cake batter. Use immediately or cover and refrigerate for up to 1 week. Makes one-half cup. Step 5Season the tuna on both sides with salt and pepper. Place a large saute pan over high heat and add the oil. When the oil is smoking, add the tuna, shaking the pan to prevent sticking. Cook 1 1/2 minutes, until crisp and brown on one side. Add the butter and flip the tuna. Cook for another 1 1/2 minutes, until the second side is crisp and brown. Step 6To serve, arrange the tuna steaks on a platter or individual plates. Spoon the warm sauce over each. Garnish each with a large three-finger pinch of the pickled onion and a pinch of the cilantro. Serve at once. In Recipes-list.com we have selected the most viewed recipes from category - Fish and shellfish Healthy eating Main courses . Enjoy the best recipes specially selected for you! 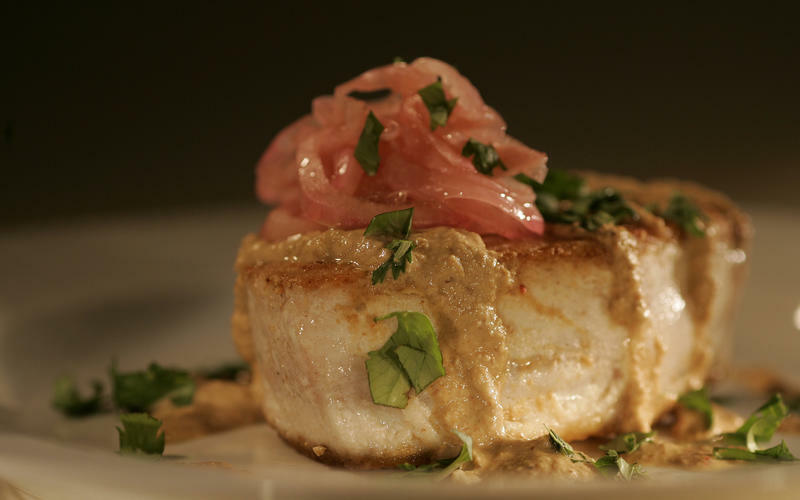 Atun del diablo (Seared albacore tuna with pumpkin seed-sesame sauce and pickled red onions) is the right choice that will satisfy all your claims.